The Barnstormers were unsuccessful on the road this past weekend as they were defeated by the Oklahoma City Yard Dawgz 42-52. The Barnstormers were the first to strike on a one yard run by Ryan Vena. The Yard Dawgz struck back quickly with touchdown which was followed by a Ryan Vena pick six and by the end of the first quarter the Barnstormers were down 14-7. The second quarter had the second Barnstormer turnover on a Rodney Filer fumble that the Yard Dawgz were able to capitalize on and bring the score to 21-7. The Barnstormers brought themselves back quickly with the help of a Charles Johnson fumble recovery and scoring twice with a Jesse Schmidt and Larry Kendrick touchdown to tie the game back up, but left enough time for the Yard Dawgz to score one more time in the half and keep themselves in the lead brining the score to 28-21. The Yard Dawgz capitalized on the second half by kicking a field goal to keep themselves ahead of the Barnstormers. After the field goal it became a game of back and forth with the Barnstormers bringing the game within the three points multiple times on two Larry Kendrick and a Jesse Schmidt touchdown receptions, but in the end the Yard Dawgz had the final say scoring on the their last possession of the game and defeating the Barnstormers 52-42. The Spokane Shock have held themselves as at to contender all season long. The Shock started at 2-2 in their first four games and since then they have not looked back being a perfect 9-0 since then. The Shock are used to perfection as they dominated the af2 in the past couple years and have shown they can compete at the higher level. The last time the Shock saw the Barnstormers they were running on a perfect record and prepared to keep it perfect, but the Barnstormers were able to rain on their parade and “Rock the Shock” by defeating them 54-48. Will the Barnstormers be able to feed off of their momentum from their last victory over the Shock and defeat them once again? Iowa Barnstormers vs. Spokane Shock will be broadcast LIVE on Television with the NFL Network and on the radio on 1700 AM The Champ, and on the Internet at www.theiowabarnstormers.com and at www.nifty-tv.com. 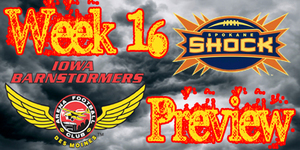 -This is the third meeting between the Spokane Shock and the Iowa Barnstormers. The series is currently tied at one a piece. -Leading Tackler: William Mulder (#6) - 12 GP, 72 tackles (63 solo, 9 assisted), 3 interceptions, 11 pass breakups and 1 forced fumble. Larry Kendrick-WR/DB-#15 Week 15 Line: 9 rec for 121 yds and 3 touchdowns and 6 KR for 83 yds. Larry Kendrick is the pure definition of an Ironman as he has shown to be a versatile player. Kendrick started the year primarily on defense as a defensive back. He quickly got the call to move to the offensive side of the ball when injuries bogged other receivers down. Kendrick had a stellar game last week doubling his season totals for receptions and receiving yard in this past game. Kendrick also scored three of the six Barnstormer touchdowns. Kendrick has also proven himself to be a very effective player as a kick returner with almost 600 yards since taking over the returner position from Tim Dodge. Kendrick is averaging over 18 yards per return. The Barnstormers are back home again next week. Don’t forget to get your tickets for the next home game Saturday July 24th when the Barnstormers take on the Iron! Call the Barnstormers Front Office to get your tickets TODAY: 515-633-2255!